The Pittsburgh Penguins took on the Philadelphia Flyers at an outdoor game in Pittsburgh on Saturday night as part of the Stadium Series. 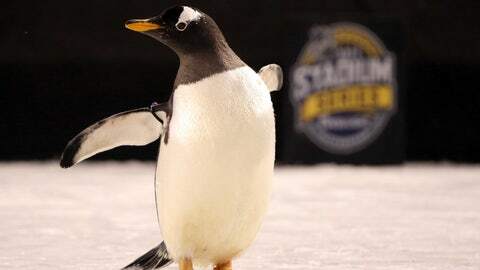 But it was the real-life penguins that stole the show at the Steelers’ Heinz Field prior to the game. According to the Pittsburgh Post-Gazette, Crosby, Kessel, Kunitz, Letang, Malkin, Murray and Sully came courtesy of the Pittsburgh Zoo & PPG Aquarium. Though their formations could have used some work. The Penguins, no doubt aided by their fine-feathered friends, ultimately beat the Flyers 4-2.